"I hope to achieve this goal here with Barcelona". Last season he featured in 22 of Bayern's 34 league outings, missing 10 of those matches due to various knocks, most notably a serious knee injury which has kept him out of action since April. Hopefully I can win three". The 31-year-old joined the Catalan giants from Bayern Munich in a move worth €20million. "This is the best team in the world, a step up to an even bigger club than Bayern Munich", he told a news conference. "I hope to be an addition who can help to win all the titles". Barcelona last won the Champions League in 2015, beating Vidal's Juventus in the final, and rivals Real Madrid have won it in each of the three seasons since, twice knocking out the Chilean while at Bayern. "I'm here to compete for a place among the best", said Vidal, who was accompanied by his son, Alonso, and dressed in black for the presentation. "I am here to win all the trophies available and I will give everything on the pitch to achieve this." he said. 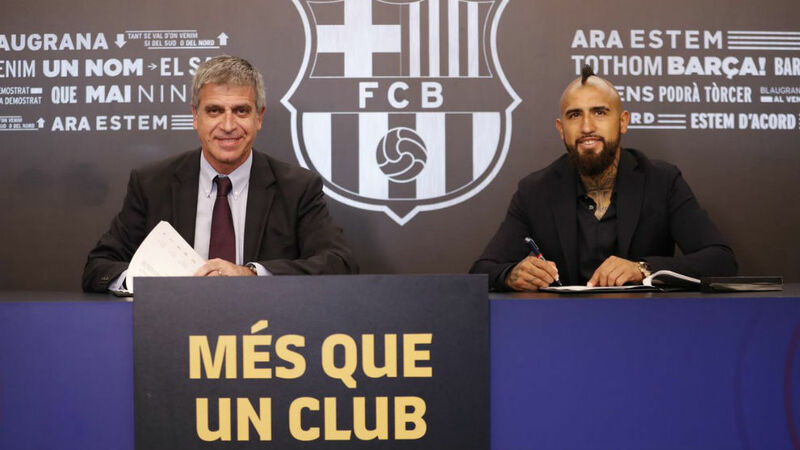 Vidal is Barcelona's fourth first-team signing this summer, following the arrivals of Brazilians Malcom and Arthur from Bordeaux and Gremio respectively, and French defender Clement Lenglet from Sevilla.